Eighty years ago in May, this statue was erected by the people of Pierrefeu to commemorate the 50 lives lost when the airship Dixmude exploded and crashed off the coast of Sicily. The dirigible had been given to the people of France as part of reparations from Germany following WW1 and was based at the airfield down in the plain, below the village. 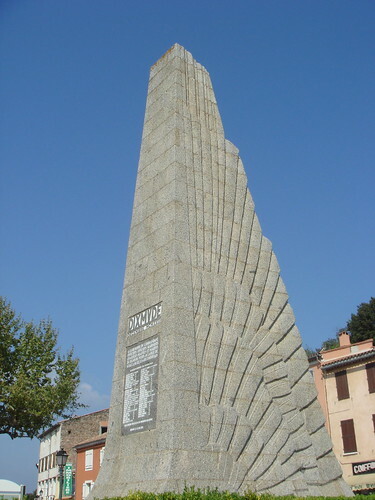 In the shape of a giant wing, the memorial lists those who died, all local men. This entry was posted in Uncategorized on April 27, 2007 by hodgers.